The French Alps - possibly the best riding in the world? Well, anywhere in the Alps actually. It doesn't specifically have to be in the French part - good roads and mountains don't recognise political boundaries. Why are the High Alps so good? It would almost certainly involve a long-haul flight to get there. Just the sheer splendour and magnitude of the mountains. You can ride around Mont Blanc, Europe's highest mountain at 4800m. It's always snow covered, as the name suggests. You can ride over the highest paved mountain pass in the Alps - the Col de L'Iseran just above the ski resort of Val D'Isere. This climbs to 2770 metres above sea level, and is usually blocked by snow until mid-June. You're riding at altitudes of about 6 times higher than anything in the UK. The roads twist and turn for mile after mile after mile; there are few cars around in early season; the road surfaces are mostly good with excellent grip; there are no traffic jams or speed traps; you're surrounded by snow capped peaks and tumbling glaciers; and for most of the time the sun shines brightly as well. Need I go on? Ok I will. It's very hot down in the valleys, often 35 to 40 degrees Celsius in Summer, but as soon as you climb up the valleys towards the high mountain passes (known as "cols") the air is cool, crisp and invigorating. Bikers are welcomed here, and many small restaurants lay on a special menu for you. Photo opportunities are never ending, and you can even fit in a bit of summer skiing while you are here. At the end of the day, when the riding is done, you'll find eating out is better value than England, and although bar tariffs can be high, chilled 1664 from the supermarkets is exceptionally good value, and it's a higher quality product that the stuff they sell us back home. A favourite base of mine is the little town of Bourg St Maurice. This normal French town is busy throughout the year, and is able to offer the visitor something of interest in all 4 seasons. In winter, it sits beneath the ski resort of Les Arcs and in summer it's an ideal location for mountain sports such as Paragliding, mountain biking, river rafting and of course motorcycling. The ultimate ride for me, is a circular route I've named the "Circuit de Mont Blanc" which can start and finish in Bourg St Maurice, or at any point en-route either. This 200 mile route pulls in 10 mountain passes across 3 different countries; France, Switzerland and Italy. We begin with the Cormet du Roselan which climbs steeply out of Bourg St Maurice heading for Beaufort, which is famous for its cheese. A little detour via the barrage and the "Col du Pre" makes sure we get an extra col in the bag which wouldn't normally fall naturally into the circuit. A steady route via Flumet, Megeve and Chamonix sees us through some of the glitziest ski resorts in Europe. We ride beneath a truly imposing icefall near the mouth of the Mont Blanc tunnel, before reaching the Col du Forclaz and Martigny over the Swiss border. There's an extra little route via Champex I've still not ridden, but note it will add yet another diversion to this already spectacular day route. We then take on the magnificent Col du Grand St Bernard, which is my personal favourite. Very challenging, very high, very twisty, with a fairly well-surfaced road taking us to its summit and the border with Italy. We pass a shimmering frost edged lake, then commence the exhilerating descent into the Aosta valley in Italy. A little tiresome straightroad riding in the intense summer heat soon passes, before we cut short our obvious route towards Courmayeur and the Petit St Bernard. A little known pass called the St Carlo is worth doing. I found this almost by accident, and it "cuts the corner" to La Thuile. The road is a well surfaced, demanding succession of continuous hairpins, which enables you to bag yet another col, before conquering the last one of the day - the Petit St Bernard, which takes you back over the top into France again. The final drop down to Bourg St Maurice from La Rosiere will have your hands and wrists crying out for mercy, after braking hard for every hairpin bend, time after time for the tenth occasion today! Half way down, you'll be hit by an intense wall of heat as the coolness of high altitude gives way to the low lying sun trap of the valley bottom again. I've seen people literally shaking with the adrenaline rush and exhaustion after completing this final run of the day. Either get yourself straight down to the open air swimming pool before the sun goes down, or..
Not before mid-May as the high mountain cols will still be snow bound. June & July - probably the best. June - snow only just receding, alpine flowers emerging and Marmottes coming out of hibernation. Late June sees a Motorcycle Rally (The Trans' Vanoise) and the Fete de St Jean taking place in Bourg St Maurice. The ski lifts operate in the months of July & August as this is now "high season", along with the opening of the open air pool and all the mountain restaurants. Everything is open in July and August, but it can be very very hot, and relatively busy. September & October are shoulder season, pretty, and still warm, but things are starting to close down for the approaching winter. Anytime from early to mid October, it may start to snow on the mountains. November can see major snowfall, and then, it's a whole new ball game. The ski season begins again, and many of the roads you've just enjoyed riding up and down now become ski runs again until next May. www.lesarcs.com Bourg St Maurice Tourist Board site. www.alpineroads.com Descriptions of all the major Alpine passes in France, Italy, Austria and Switzerland. 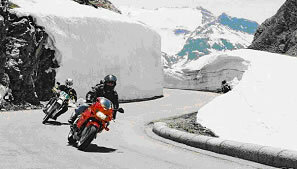 Information and organised motorcycle tours to the alps.